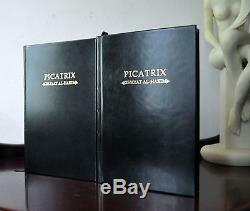 PICATRIX 1 & 2 Ouroboros Leather Grimoire Ltd 1st Ed Signed William Kiesel Occult Black Magick RARE. The Goal of the Wise. 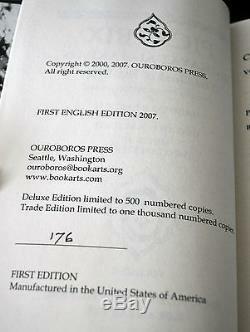 Ouroboros Press, Seattle, 2002, 2007. 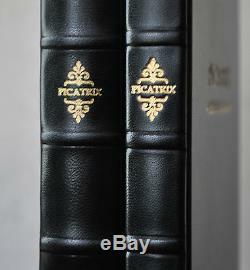 This is a very rare and limited 1st leather edition of the infamous PICATRIX. Or, The Goal of the Wise, published by Ouroboros Press in a two volume, leather bound edition. 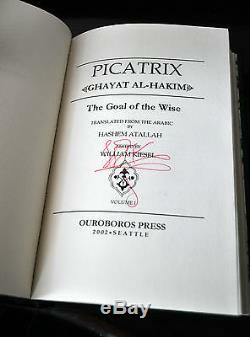 Volume 1 was published in 2002, and Volume 2 was published in 2007. It presents an Engish translation of this notorious work. Both books are in mint condition, bound in sturdy black leather, with gilt titling & 5 raised bands on the spine, with marbled endpapers and come with black head & tail bands, and a black ribbon. Volume 1 is numbered #84 of a total of 1,000 numbered copies (which would have included the standard cloth edition - so the number of leather bound copies would have been much smaller). The first volume has also been signed by the editor, William Kiesel, and it is very rare to find a signed copy of this work. 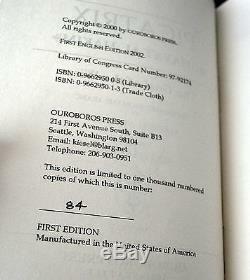 The second volume is unsigned, and is numbered #176 of 500 (deluxe edition copies). This important grimoire would make a significant addition to any serious occult library. This is the last set that I have available, and is the only time I have seen a signed copy. Check out my other items. & b e sure to add me to your favourites list. As I will be listing many other Rare & hard-to-find books, artworks and many other items of interest. The item "PICATRIX 1 & 2 Ouroboros Leather Grimoire Ltd 1st Ed Signed W Kiesel Occult RARE" is in sale since Thursday, September 12, 2013. This item is in the category "Books\Antiquarian & Collectible".